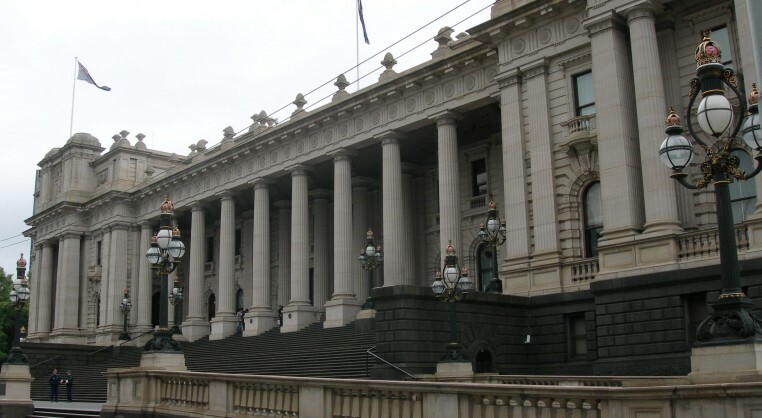 From 1901 to 1927 Melbourne’s Parliament House was the home of the Commonwealth Parliament. Melbourne was in effect the capital of Australia, and it was here that many of the major events of the early Federal period took place. Next stop is Melbourne Town Hall via Collins Street. So declared Opposition Leader and future Prime Minister, Andrew Fisher. And it was here on the 5th August 1914 where the Australian Government declared war on Germany, along with the commitment to provide an initial expeditionary force of 20,000 men to Britain. The war was declared during an election campaign, and so the new parliament had to move quickly. It was also here at Parliament House that major and exceptional legislation was passed. It was called the War Precautions Act of 1914, which curtailed freedom of speech and perceived anti-war activities. The Constitution was in effect suspended and the Commonwealth Government was able to make laws about anything that affected the war effort. Trading with the German controlled companies was stopped, farmers wheat and wool crops were compulsorily bought, prices of many goods were fixed, Australian residents from German or Austrian descent were interned or locked up without trial, and letters and publications were censored. Furthermore, a person could be declared guilty of any action that undermined the war effort. This included destroying official posters for conscription referendums, singing anti-conscription songs, or printing and handing out leaflets about anti-conscription protests. Parliament House was also the venue for one of the county’s most divisive political battles. Prime Minister Billy Hughes had witnessed firsthand Australia’s troops in the trenches of France and in the hospitals of England, and he passionately believed in the need for urgent reinforcements. By 1916 the Australian nation was divided over the question of military service overseas. Regular and lengthy death notices dominated the newspapers and the community began to tire of a war that seemed endless. Hughes’ proposal to introduce conscription was defeated after a bitter and divisive political campaign. Consequently he was expelled from the Labor Party, and he and many of his colleagues formed a new Nationalist Party government. “I did not leave the Labor party. The party left me”. This was a time of great uncertainty and turmoil. Parliament House witnessed noisy protests and civil unrest about the rising cost of living, low wages and increasing hardship, particularly felt by women. During August 1917 Parliament House was stormed by protesters demanding fair paid work. 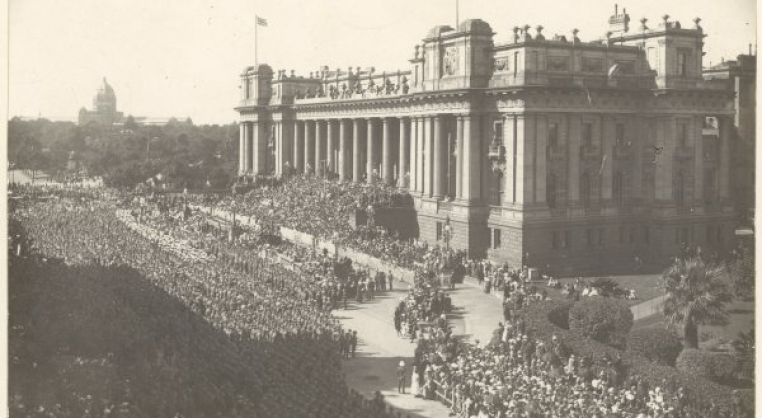 But at the end of the war, it was in front of the Parliament House that significant public events and celebrations such as Armistice Day celebrations occurred. When news that Germany had signed the armistice arrived, it spread like wildfire throughout Melbourne. Huge cheering crowds poured into the city and thronged the streets and a public holiday was declared. And over the following months, parades of returned service personnel marched past Parliament House in an atmosphere of alternating revelry and solemnity. Now make your way to the Melbourne Town Hall via Collins Street.